October 29th dawned bright and chilly. The day marked the beginning of the Galveztown Yawl Project at LAMP Boatworks. The Galveztown is a replica brig under construction in Malaga, Spain. LAMP Boatworks is a principal project partner supplying the Spanish shipyard, Astilleros Nereo, with Live Oak timber for the construction of the ship’s hull. LAMP is also assisting the project by building two yawls. These small ship’s boats will be 14 and 16 feet long and will travel nested on the deck of the Galveztown after the tall ship calls in St. Augustine in 2011. All craft, be they ships or boats, require fairly special lumber. The process begins with the collecting of tree trunks of suitable timber and then milling them into the required dimensions and shapes. 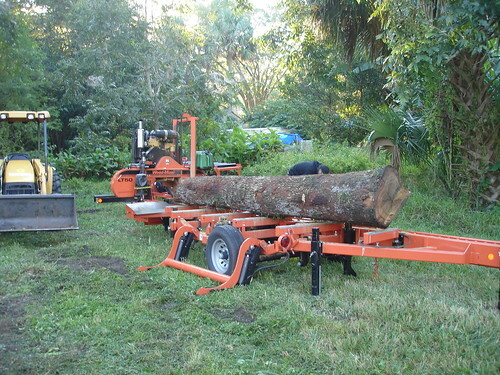 LAMP Boatworks was assisted with the milling by Joe Williams of Joe Dirt Inc.. Joe has just taken delivery of a brand new Wood-Mizer portable sawmill and this was his first offsite custom milling job. This particular mill was equipped with a hydraulic log handling system that takes the log from the ground to the mill’s log deck. This system permits the turning and manipulation of the log on the mill saving lots of effort on behalf of those operating the mill. The first log was milled specifically with a keel in mind. A suitably large and straight trunk of live oak had been selected for this purpose. Logs were gotten onto the log handler using a small tractor with a front bucket which could move and push logs that weighted as much as a ton and a half. Once on the mill the log was “squared up” and then measured to see what necessary lumber could be obtained from the log. This particular log had checking (cracks caused during seasoning) down the middle of the heartwood so the keel timbers were cut from wood further out in the trunk. In addition to the timber for the keel, wood was cut for the keelson, the timber that lies upon the tops of the frames, or ribs, and which is bolted through the frames to the keel to form the solid backbone of the yawl. A number of one and a half and one and a quarter inch slabs were produced from which we hope to obtain some of the floors and futtocks which make up the frames or ribs of the boat. Another log with a compound curve in it was also milled. Two large three-inch slabs were cut from which LAMP Boatworks boat builders will fashion the stem of the boat. The stem is attached to the keel of the vessel and forms the central part of the bow to which all the crafts forward planking is attached to form the hull. 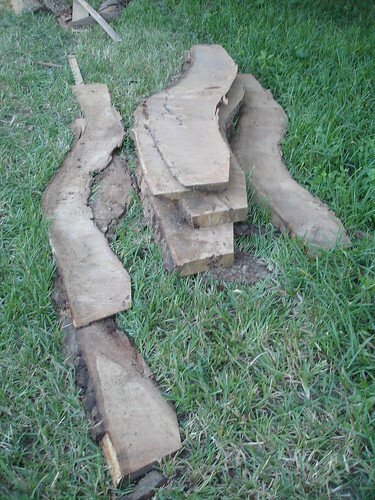 This curved log is a good example of what in past times ship and boat wrights sought in timber that was to be used for frames, stems, knees, and riders. These curved pieces are also those which today are almost certainly chipped, taken to the land fill, or otherwise destroyed. 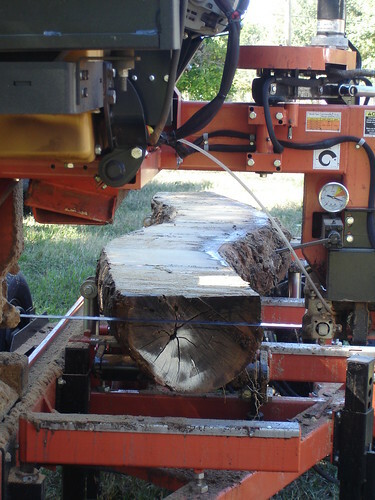 A straight section of tree trunk has some chance of making it to a mill, but today there are very few calls for lumber that is not straight. 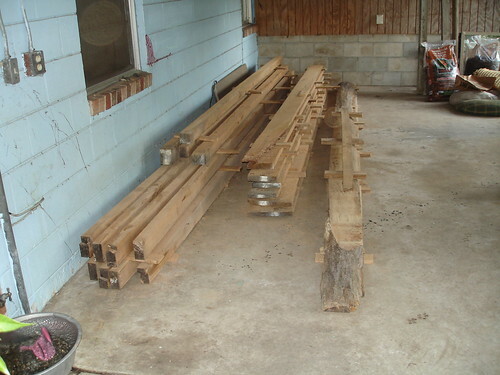 After milling, the fresh cut lumber was stacked and stickered under a covered area for air drying and curing. Stickering is a method of stacking fresh cut lumber so that air may circulate freely around it and so achieve nice dry working lumber as soon as possible. The stickers are simply small pieces of lumber that are often milled out of portions of a log that is too small to provide lumber of any substantial or usable dimensions. LAMP Boatworks wants to take this opportunity to thank Joe Williams of Joe Dirt, Inc., for all his help. The lumber he helped mill will air dry over the next two months and be ready in the New Year when LAMP Boatworks begins to build the first of its two planned yawls. Very cool videos. Good to see you blogging, Sam, and good to see the initial phase of this construction getting off the ground!